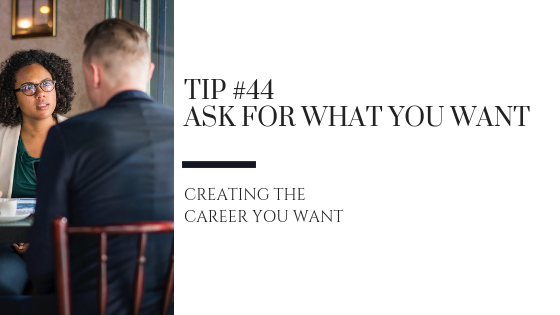 In any career, there are moments when you want something of importance – it may be a salary increase, a change in title, a flexible work arrangement, or something else – and you may hesitate to ask for it. You may begin to negotiate against yourself – telling yourself all the reasons why this is not the right time to ask or all the reasons why you’ll never get a positive response. You may end up talking yourself right out of asking for what you want, but unless you have a prescient and benevolent boss, you have to ask for what you want in order to get it. Do your homework and then ask for what you want. This is a negotiation. In order to maximize your chances of achieving the best outcome, it’s vital to prepare well before you engage. First of all, know what you want and why it’s important to you. Be clear about your own accomplishments, value, and contributions. If relevant, gather market data to help support your request. Think about how you will open the discussion, and what you can say that will be compelling to your boss. Find a way to make what you are requesting a win-win for you and your boss. Try to raise your request at a time when your boss will be most receptive. It may be before or during your annual review, or perhaps after you experience a big win or execute a large project. Practice the conversation with a friend. Anticipate your boss’s reactions and think about how you will respond. Use your best negotiating skills on your own behalf as you create the career you want.